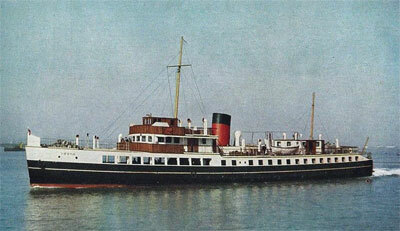 MV Vecta was built in 1938 for Red Funnel by Thornycroft at Woolston. She incorporated twin Austrian supplied Voith-Schneider propellers which gave greater manoeuvrability but these were replaced by conventional propellers at the beginning of WW2 as spare parts were not available. Although she was destined for the Dunkirk evacuation, she had to turn back due to mechanical problems. 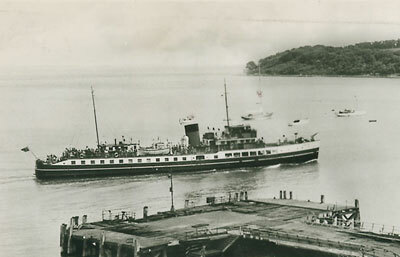 She was used on the Southampton/East Cowes/West Cowes route and was able to carry 12 cars on the deck, underneath the bridge and forward passenger deck. Vehicles were loaded through large doors on the starboard side. She was sold in 1965 to Townsend Car Ferries and was used in the Bristol Channel under the name 'Westward Ho', she was scrapped in 1996.